In the last few weeks Colombia has once again seen momentum regarding the e-voting debate. According to experts, as a consequence of the peace negotiations carried out by the government with the country’s armed insurgencies, it has become necessary to strengthen electoral guarantees. The discussion stems from the friction between a magister of the National Electoral Council (CNE), Armando Novoa, and National Registrar Juan Carlos Galindo over the delays in the application of e-voting. A group of senators has announced that they will sue the authorities on the grounds of delaying the application of this technology. 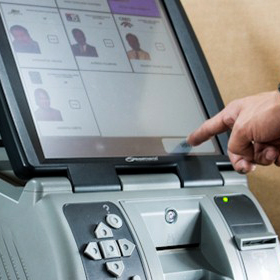 Since 2004, Colombia has a law that allows for electoral automation, but given the lack of will to modernize voting, the country has had to insist on the use of a voting system that has brought about serious problems: a partial use of biometric identification, manual voting, pre-counts (initial results of purely informative value), and digitization of the statements of vote to make them available to the public on the National Registry website. Facing these facts, and with the possible conduction of a peace referendum looming, magistrate Novoa fired the first shot on the matter, stating that it was not just a lack of resources that has stopped electronic voting, but also the Registrar’s opinion on the technology, which he judges inconvenient for Colombia. Novoa reminded him that automation “is not an option”, but rather a legal duty. At the same time, columnists from several newspapers fanned the flames. Constitutional lawyer Germán Calderón España argued against the costs of manual voting versus those of e-voting, while Pedro Luis Zambrano stated that public contracts related to manual voting are keeping automation hostage. On the other hand, a group of senators announced that they will pursue legal actions to demand Registrar Galindo to uphold the law. The group affirms that “it is urgent to implement electronic voting and a biometric system that provides guarantees and transparency in elections, with the aims of reducing fraud and other electoral crimes, as well as corruption”. So far, Colombia is waiting for the results of an advisory commission on the implementation of this technology. However, this interdisciplinary group has failed to meet for almost two years, even after an international call was placed and answered by 16 companies to outline a pilot test for an automated voting system. To the date, experiments with two automated voting models have been permitted (Optical Scan Voting and Direct Recording Electronic, DRE), but Colombia is still delaying a ruling that would allow them move past a system which sometimes does work for presidential elections, but cannot handle the greater complexity of parliamentary or local ones. The Dominican Republic have failed in their attempt to partially automate their voting system during the general elections carried out on May 15th. Different voices inside and outside the country have pointed out that non-compliance of internationally followed standards doomed this attempt at modernizing the vote. For their most recent voting process, the Central Electoral Board hired the Spain-based Indra Sistemas to provide biometric identification and automated voting technology. Results were clearly negative, given the logistic, technical and operational errors found both in the fingerprint capture devices and the vote counting machines. Regrettably, the company’s lack of experience in biometric voter authentication and electronic vote counting was all too clear. NGO Participación Ciudadana published a report stating the several problems encountered during the election, highlighting they included delays in opening polling centres due to issues with and the lack of biometric ID and counting units. There were anomalies in 62.4% of the circuits with the vote counting machines, and in 40.4% of them with voter verification, while “30.7% of the polls registered problems with ballot scanning and 30.9% with electoral data transmission”, with the result that 97.7% of the centres had to resort to manual counting. In view of these results, the NGO states that the electronic vote count and transmission, namely the novelty of this election, “were largely handicapped by the lack of equipment, the failures of the available working devices, and the scant little capacity to solve problems (…) to the extent that at 10:00 PM, four hours after the closing of the polls, only 20% of the electoral data had been transmitted, which forced the authorities to resort to manual vote counting at all three levels (presidential, regional and local)”. These problems were confirmed in the preliminary report of the Organization of American States (OAS) observation mission, which states that “the weakest point of the day was the voting equipment used”. The report goes on to mention that “in several centres equipment was missing, tech support staff did not show up, or there were connectivity and operation issues with the biometric control and automated vote counting machines”, so “the implementation of manual counting was needed to overcome these multiple setbacks”. In addition to this, the authorities underestimated the importance of carrying out tests that could have prevented these problems on time, or opting for a gradual implementation of the technology. Even the OAS highlighted the need for its progressive implementation. The Dominican Republic now faces the possibility of having thrown away public trust and sizable public resources, which could have been used to provide the country with a voting system that not would have automated some stages of the process only, but would have added technology and security to the election as a whole. Argentina had a 2015 full of difficulties when it came to electoral matters. First, a tight electoral schedule that forced a series of voting events all over the country; and second, there were failures not only with manual voting, but also with the Single Electronic Ballot (BUE) used in some regions. Facing the need to fix such issues, the country eagerly awaits the electoral reform that the Executive will put forward in the upcoming weeks. The authorities have set to create a law that deals with the modernization of the voting system, where automation could replace the country’s outdated manual procedures. Regarding the discussion this proposal entails, and which is now taking place in the political sphere, it is worth noting that successful automation cases have all dutifully taken a series of provisions, such as: adopting automation progressively; evaluating the local infrastructure and all possible obstacles; considering the system’s sustainability (i.e. its endurance and worthiness over time), and searching and comparing a variety of offerings in the market. When it comes to automation, Argentina is already under way. In the year 2015, e-voting was successfully implemented in the Cordoba province , and the province of Salta and the city of Buenos Aires saw automated vote counting. Finding the right automation model is a tall order, since there are several offerings from different companies. When it comes to choosing, it is vital to carry out a bidding process that meets the highest standards, and which considers the summons of international, experienced suppliers. The technology to be implemented must provide a flexible e-voting model, one which meets the legal, technical and financial needs of the country, as well as its idiosyncrasies. The challenges are varied, but it is necessary that all authorities, political parties and citizens are careful about all the aspects of automation. Technology can be used to make any step of an election easier, but its proper and massive use will make the difference between automated and manual processes.